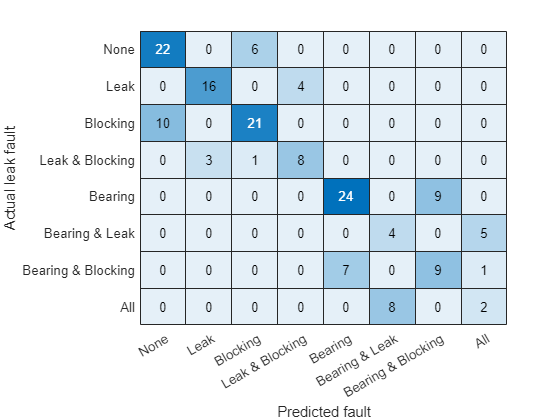 This example shows how to use a Simulink model to generate fault and healthy data. The data is used to develop a multi-class classifier to detect different combinations of faults. The example uses a triplex reciprocating pump model and includes leak, blocking, and bearing faults. This example uses many supporting files that are stored in a zip file. Unzip the file to get access to the supporting files, load the model parameters, and create the reciprocating pump library. The reciprocating pump consists of an electric motor, the pump housing, pump crank and pump plungers. The pump model is configured to model three types of faults; cylinder leaks, blocked inlet, and increased bearing friction. These faults are parameterized as workspace variables and configured through the pump block dialog. For each of the three fault types create an array of values that represent the fault severity, ranging from no fault to a significant fault. The pump model is configured to include noise, thus running the model with the same fault parameter values will result in different simulation outputs. This is useful for developing a classifier as it means there can be multiple simulation results for the same fault condition and severity. To configure simulations for such results, create vectors of fault parameter values where the values represent no faults, a single fault, combinations of two faults, and combinations of three faults. For each group (no fault, single fault, etc.) create 125 combinations of fault values from the fault parameter values defined above. This gives a total of 1000 combinations of fault parameter values. 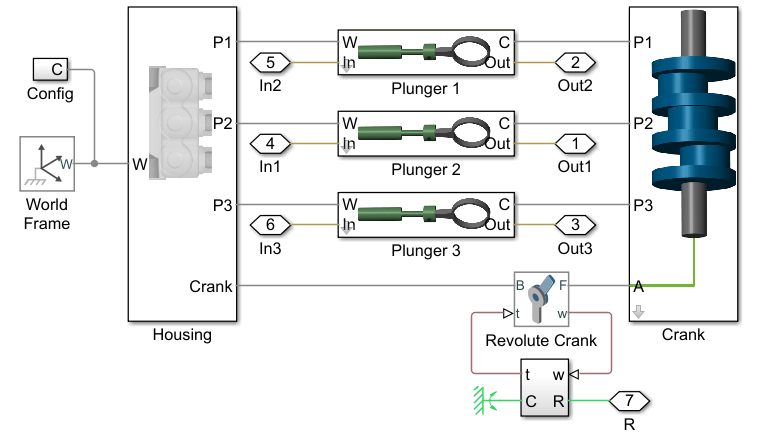 Use the fault parameter combinations to create Simulink.SimulationInput objects. For each simulation input ensure that the random seed is set differently to generate different results. Use the generateSimulationEnsemble function to run the simulations defined by the Simulink.SimulationInput objects defined above and store the results in a local sub-folder. Then create a simulationEnsembleDatastore from the stored results. Note that running these 1000 simulations in parallel takes around an hour on a standard desktop and generates around 620MB of data. An option to only run the first 10 simulations is provided for convenience. The model is configured to log the pump output pressure, output flow, motor speed and motor current. For each member in the ensemble preprocess the pump output flow and compute condition indicators based on the pump output flow. The condition indicators are later used for fault classification. For preprocessing remove the first 0.8 seconds of the output flow as this contains transients from simulation and pump startup. As part of the preprocessing compute the power spectrum of the output flow, and use the SimulationInput to return the values of the fault variables. Configure the ensemble so that the read only returns the variables of interest and call the preprocess function that is defined at the end of this example. Plot the flow and flow spectrum. The plotted data is for a fault free condition. The flow spectrum reveals resonant peaks at expected frequencies. Specifically, the pump motor speed is 950 rpm, or 15.833 Hz, and since the pump has 3 cylinders the flow is expected to have a fundamental at 3*15.833 Hz, or 47.5 Hz, as well as harmonics at multiples of 47.5 Hz. 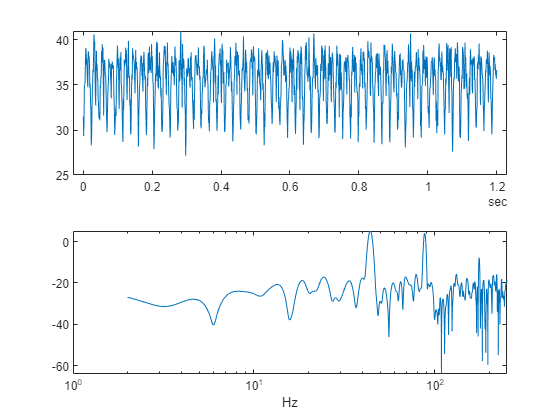 The flow spectrum clearly shows the expected resonant peaks. Faults in one cylinder of the pump will result in resonances at the pump motor speed, 15.833 Hz and its harmonics. The flow spectrum and slow signal gives some ideas of possible condition indicators. Specifically, common signal statistics such as mean, variance, etc. as well as spectrum characteristics. Spectrum condition indicators relating to the expected harmonics such as the frequency with the peak magnitude, energy around 15.833 Hz, energy around 47.5 Hz, energy above 100 Hz, are computed. 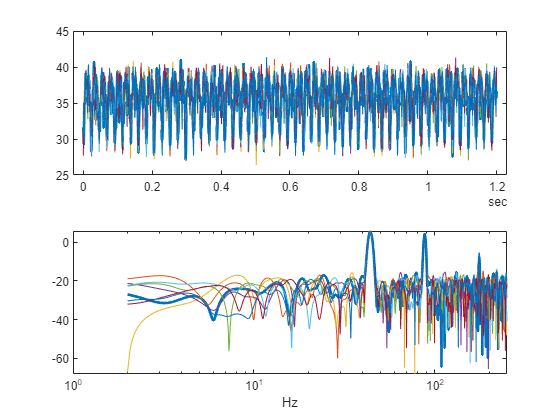 The frequency of the spectral kurtosis peak is also computed. Configure the ensemble with data variables for the condition indicators and condition variables for fault variable values. Then call the extractCI function to compute the features, and use the writeToLastMemberRead command to add the feature and fault variable values to the ensemble. The extractCI function is defined at the end of this example. The above code preprocesses and computes the condition indicators for the first member of the simulation ensemble. Repeat this for all the members in the ensemble using the ensemble hasdata command. To get an idea of the simulation results under different fault conditions plot every hundredth element of the ensemble. Note that under different fault conditions and severities the spectrum contains harmonics at the expected frequencies. The previous section preprocessed and computed condition indicators from the flow signal for all the members of the simulation ensemble, which correspond to the simulation results for different fault combinations and severities. The condition indicators can be used to detect and classify pump faults from a pump flow signal. % Get data to design a classifier. Preserving jobs with IDs: 1 2 because they contain crash dump files. You can use 'delete(myCluster.Jobs)' to remove all jobs created with profile local. To create 'myCluster' use 'myCluster = parcluster('local')'. The fault variable values for each ensemble member (row in the data table) can be converted to fault flags and the fault flags combined to single flag that captures the different fault status of each member. Create a classifier that takes as input the condition indicators and returns the combined fault flag. Train a support vector machine that uses a 2nd order polynomial kernel. Use the cvpartition command to partition the ensemble members into a set for training and a set for validation. Check the performance of the trained classifier using the validation data and plot the results on a confusion plot. The confusion plot shows for each combination of faults the number of times the fault combination was correctly predicted (the diagonal entries of the plot) and the number of times the fault combination was incorrectly predicted (the off-diagonal entries). The confusion plot shows that the classifier did not correctly classify some fault conditions (the off diagonal terms). However, the no fault condition was correctly predicted. In a couple of places a no fault condition was predicted when there was a fault (the first column), otherwise a fault was predicted although it may not be exactly the correct fault condition. Overall the validation accuracy was 84% and the accuracy at predicting that there is a fault 98%. Examine the cases where no fault was predicted but a fault did exist. 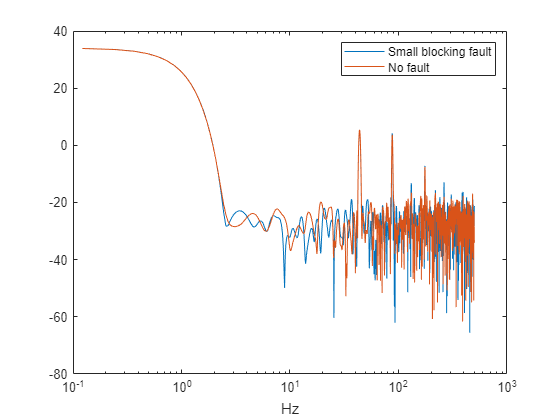 First find cases in the validation data where the actual fault was a blocking fault but a no fault was predicted. Find cases in the validation data where the actual fault was a bearing fault but a no fault was predicted. Examining the cases where no fault was predictive but a fault did exist reveals that they occur when the blocking fault value of 0.77 is close to its nominal value of 0.8, or the bearing fault value of 6.6e-5 is close to its nominal value of 0. Plotting the spectrum for the case with a small blocking fault value and comparing with a fault free condition reveals that spectra are very similar making detection difficult. Re-training the classifier but including a blocking value of 0.77 as a non fault condition would significantly improve the performance of the fault detector. Alternatively, using additional pump measurements could provide more information and improve the ability to detect small blocking faults. 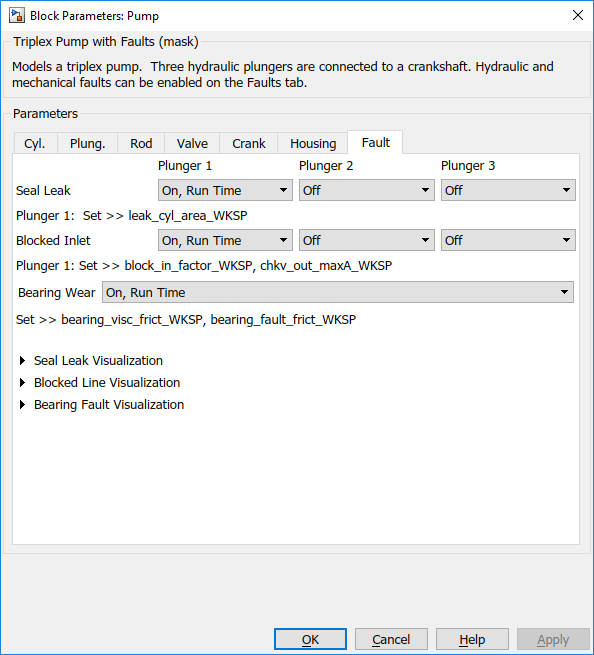 This example showed how to use a Simulink model to model faults in a reciprocating pump, simulate the model under different fault combinations and severities, extract condition indicators from the pump output flow and use the condition indicators to train a classifier to detect pump faults. 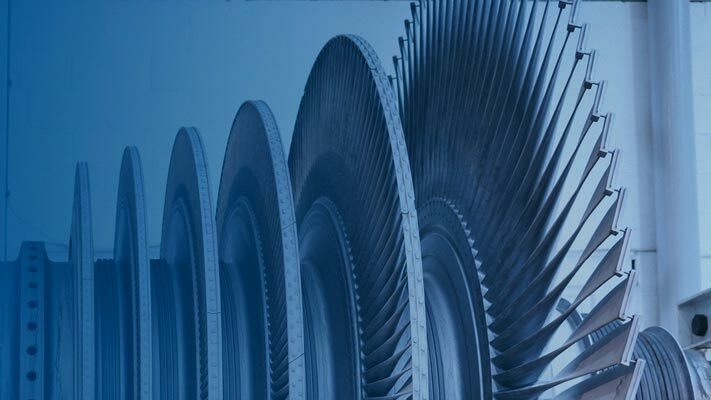 The example examined the performance of fault detection using the classifier and noted that small blocking faults are very similar to the no fault condition and cannot be reliably detected. % Helper function to preprocess the logged reciprocating pump data. % Find the frequency of the peak magnitude in the power spectrum. % Compute the power in the low frequency range 10-20 Hz. % Compute the power in the mid frequency range 40-60 Hz. % Compute the power in the high frequency range >100 Hz. % Compute the flow cumulative sum range. % Collect the feature and feature values in a cell array. % characteristics (rms, peak2peak, etc.) to the cell array.